Wessex Local Medical Committees (LMCs) is the statutory representative body for GPs across the counties of Dorset, Hampshire, the Isle of Wight, Bath & North East Somerset, and Wiltshire. They also provide services to the Islands of Jersey and Guernsey, representing in total around 3,300 GPs. You can log into www.wessexlmcs.com using your FourteenFish email and password to access function on their website such as booking on events and their DBS service. 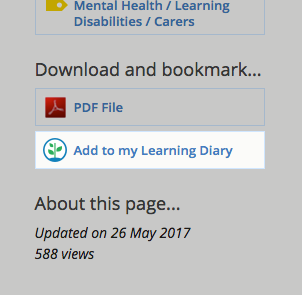 If you are reading something on www.wessexlmcs.com that you think is worth recording as CPD, just click Add to my Learning Diary in the right hand area. The details of the page as well as all the text will then be pre-populated in your Learning Diary ready for you to add your own learning points and reflection. Pretty neat ? Wessex are one of the many LMCs we work with. We designed and built their website and mobile app, and they use our Database system to store all their contact information and records for their 3,300 members. Our system also powers their event bookings and all of their digital services.